The executer believed these stems to be early 19th century Pairpoint, I suspect Sinclaire, Hawkes or one of their British contemporaries (Webb / Rock Crystal). The champagne flutes / wines have a striking design with bell shaped flaring bowls and hollow deep neck. Webb Continental Hand Cut Lead Crystal Goblets Set of 6. In the original presentation case, brown box with orange liner. This lovely piece of cut crystal is decorated with an elegant floral design. 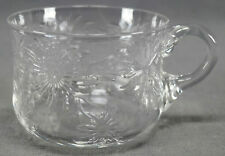 Very nice Thomas Webb rock crystal finger bowl and saucer. Ground and polished pontiled base. Circa 1900. I have 6 finger bowls and saucers available. Very nice set of 8 Thomas Webb rock crystal dessert wines. Ground and polished pontiled base. Circa 1900. These are antiques and may have small in manufacture defects that do not effect the display-ability of the pieces. Ground and polished pontiled base. Circa 1900. These are antiques and may have small in manufacture defects that do not effect the display-ability of the pieces. Marked “Thos Webb England” on the base. -These goblets will beautifully grace any table setting. Webb Corbett Crystal. Excellent Condition. C 1941 Included in this lot: 6 Liquor Cocktails ( 31/2") and 5 Cordials (3 1/8"). Also included is the 32 oz pitcher and the Decanter with no stopper. It is the new owners' responsibility to clean. This is a beautiful Webb Corbett large trumpet shaped heavy crystal cut glass vase with diamond cuts and the rim has thumbprints. It is nice and clear and sparkly. The bottom is signed Webb Corbett England with an S.
Superb clarity to these fine glasses. Terrific for a sip. A fine addition to your collections. Date: circa 1980. For sale are 6 Thomas Webb & Sons Crystal Champagne Glasses. Each one is marked with the etched "Webb England" mark which would date them to between 1950 - 1966. I think the pattern is WET39. It has a cut laurel and criss cross / cross hatch design. Vintage Thomas WEBB Lead Crystal Vase - In original box w/stickers! In original pesentation box lined with pink satin. The fronds or ferns encircle the glasses at an angle and are repeated on the bottom. The Webb-Corbett Art Glass Co. was founded in 1897. They produced fine quality lead crystal. WEBB CORBETT – ENGLAND. These Webb bowls are decorated with an arch and cherry blossom design. Although this pair are unsigned, there are examples online of goblets with identical patterns that bear the Webb acid mark. These have polished pontils underneath. Fabulous set of four (4) champagne or sherbet glasses from Thomas Webb. They are not new, but have been very well taken care of. The crystal is nice and clear. Each of these lovely glasses are signed on the bottom "Webb England". Upper offer is a Webb Corbett made in England cut glass vase standing 10 in tall. This is an excellent used condition I found no chips or cracks there are some scrapes on the bottom as would be expected with the age of the vase the bottom is marked would be Webb Corbett made in England Circa 1930 to 1947. Please see all photos as part of the description and condition of the item. If you have any questions please feel free to ask. I will combine shipping whenever possible please just ask for an invoice for the correct postage. Thank you for shopping with us and please don't forget to check out the rest of our shop thank you. Made in England. 6" tall and 3.75" across at the top. Great size -- weighted bottom. Looking for crystal, Christmas decor, fine china, art?. WEBB CORBET / ROYAL DOULTON. ACID ETCHED "ROYAL DOULTON" MARK. SET OF SIX (6). CUT CRYSTAL. NO DEFECTS OR EVIDENCE OR PRIOR USE. Up for your consideration are 3 Webb Corbett cut crystal finger bowls. One of them has a small chip on the rim (see photo). Pattern is a 7 leaf palm separated by an eight point star in a large diamond and criss cross/diamonds in the bottom of the bowl. 5 Webb Corbett England 8 Oz 3 3/4” Glasses Fan Thumbprint Design. Unsigned. 2 1/2” across rim. Outstanding quality. No chips or cracks.